You finally won the battle of wills with your cat, transitioned him to a raw diet, and all of a sudden you prepare his meal with a whole bunch of love and care only for him to sniff it and turn around – What a slap on your face you think! What happened? It’s the same food he was devouring yesterday! The first - and the most important - thing to do is to rule out illness. If kitty is acting completely normal and in a sudden hunger strike, more often than not when in a raw diet, the problem is boredom. Prior to transitioning to a raw diet, most pet parents are accustomed to feeding their cats the same food meal after meal, sometimes for years, and their cats never get bored – so they naturally think it will be the same way with raw. It is no coincidence that kitty never gets tired of kibbles. Kibbles, and many canned foods are meticulously “engineered” to keep your kitties eating them, by being coated with fat, having chemicals and flavors added to it that are both irresistible and downright addictive. If that was not the case, pets would not eat processed foods. You should aim to have at least three proteins on your cats’ diet – that will provide them not only with a well-rounded nutritional profile, but will keep them from getting bored. Once you transition your cat to raw, immediately start using that protein as a base using the slow transition technique to add a second protein to the kitty’s diet. You can then use both proteins as a base to slowly introduce a third protein to the diet. When you have introduced all the proteins, you can switch them back and forth. I personally rotate proteins at every meal – my cats never eat the same protein twice in a row. While EZComplete is considered almost a topper by most cats with the dried liver, GLM and yolk, variety is still essential in keeping my cats happy, and has yet to fail me in all these years. You can also rotate daily, or every few days, but in my experience the more often you rotate, the more successful you will be in keeping your cats anxious for the next meal, and licking their plates clean. Many cats also get introduced to raw on ground meats, and stop eating... Then they are offed a chunk of meat and voila! That happened to our Food Fur Life Cats… Pretty much all of them! So if your cat is currently eating ground meat and no longer wants the food, try giving a little chunk of meat and see what happens. It might be time to take your kitchen scissors out of the drawer! 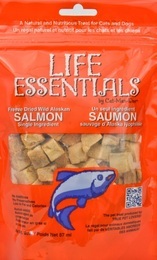 Also part of our variety, is once a week they get one or two completely plain meals – yep – no supplements, nothing! Meat only. That makes them love both the meat and EZComplete even more! If you still have problems, and we all do from time to time, you can always rely on healthy toppers to entice your cat to eat. In my home, chicken is not a favorite for my cat Lucky, and I have to admit, she is a master manipulator (anyone here can relate to that?) 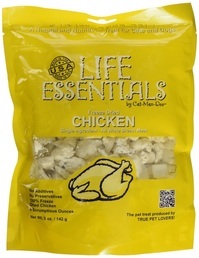 – so from time to time I do rely on her favorite treat as a topper, which….. you guessed it – is Freeze Dried Chicken! I just lightly sprinkle it over her meal, and she licks her plate clean. It’s also very important to note that cats are creatures of habit – that’s not a myth. Establishing a routine for them from the beginning is very important – from a feeding schedule, to their eating places, and even to their own plates. A set routine will impact your chances of success greatly. We discuss meal time routines in our file on transitioning from free-feeding to timed meals. One of the most valuable pieces of advice I have ever gotten, and I got MANY, was to establish a routine right off the bat when transitioning to raw – I believe that was essential for my cats being the happy carnivores they are today. I can easily see how important this is when anything breaks that routine – they go off food until their routine is back into place. If your cat suddenly quit eating, consider if anything has thrown his routine off. Last, but not least, please consider your kitties’ situation when you transitioned them to raw. Lots of pet parents make that transition due to an illness, especially IBD. There is a reason why we recommend a slow transition – always. Especially on adult or older kitties, after years of eating an inappropriate diet, it can take time for their bodies to start digesting raw properly. EZComplete has both enzymes and pancreas, which helps with digestion, but there are some kitties that make the transition with a digestive system already very compromised. These cats should be given an extra slow transition, always be on probiotics (we firmly believe probiotics are an essential part of the diet for all cats), and depending of the age or condition of the cat, they might have to start with a homemade cooked diet balanced with EZComplete, and slowly transitioned to raw. If you just transitioned to raw and feel your cat might have a tummy upset, your transition might have been be too fast. Take a step back, always follow your kitties pace, keeping a close eye on them.